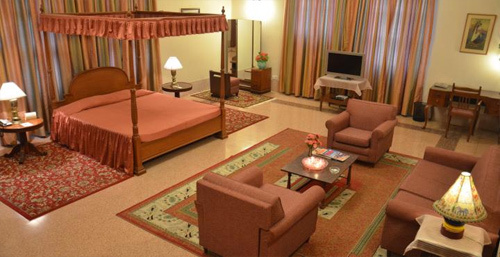 Nilambag Palace Hotel is a 4 star property, located at an accessible distance from Airport, Railway Station and Bus Station. 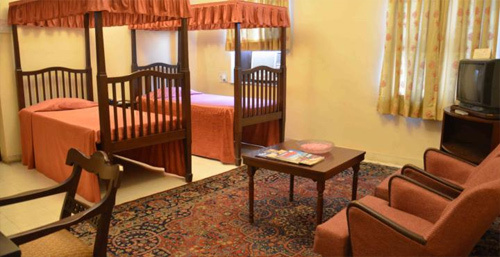 It is situated in the heart of the bustling commercial and industrial city of Bhavnagar, Hotel Nilambag Palace Hotel is a preferred accommodation option for business as well as leisure traveler. 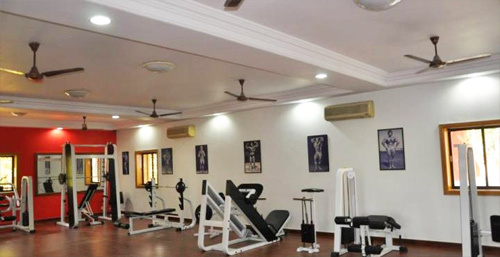 The property offers lawns, fitness center, tennis court, folk dance and cultural show, dining hall, airport pick up and drop service, banquet hall, garden restaurant and laundry service. 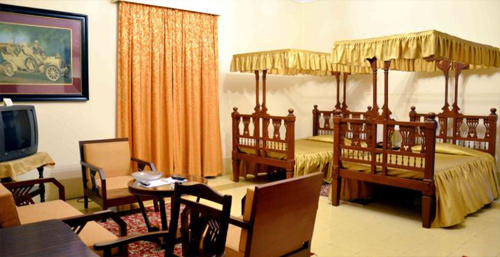 In the hectic commercial and industrial city of Bhavnagar, Nilambag Palace Hotel comes as a pleasant juxtaposition with its cres of lush green lawns and beautific foliage surround the imposing Khakhi stoned structure. 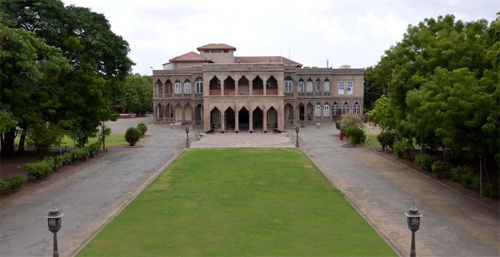 Built in 1859 A.D., this relic of the past, home to the ruling Gohil dynasty of Bhavnagar, now stands as a Heritage Hotel. 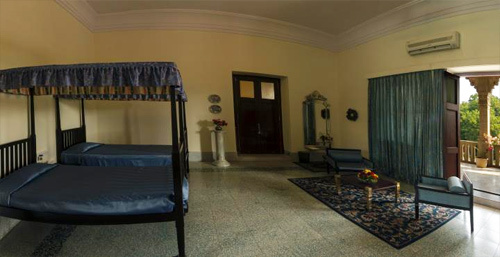 Verdant, serene and standing in mute testimony to a royal and regal past, Nilambag Palace is an ideal getaway. Guests can find some must visit areas of attraction which are closed to the property like Victoria Park, Takhteshwar Temple, Khodiyar Mandir, Aksharwadi Temple, Blackbuck National Park, Shri Adishwar Temple, Piram Bet Island and Gandhi Smriti Memorial. 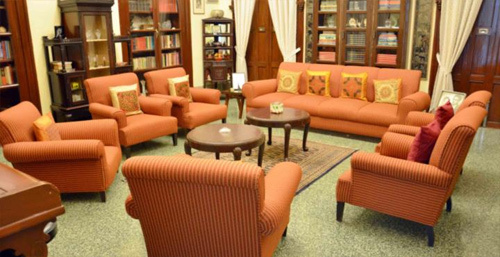 Experience a grand stay and a warm hospitality at Nilambag Palace Hotel. Sophisticatedly designed with attractive colors and textures, modern rooms of the hotel come with standard amenities and essential bathroom amenities. With a sole motto to pamper your taste buds, the hotel possesses the in-house multi-cuisine restaurant featuring sparkling Czechoslovakian crystal chandeliers and a pleasant ambiance. The restaurant is equipped with all the modern amenities and international fixtures. It offers Indian, Chinese, Continental and Kathiyavadi food. The hotel also houses bar that offers a wide variety of beverages and drinks. Guests may sip on their favorite coffee at the in-house coffee shop. The air conditioned conferencing and banqueting spaces available at the hotel are ideal for organizing business and social events like hosting seminars, musical evenings, weddings, exhibitions, parties and dance recitals. 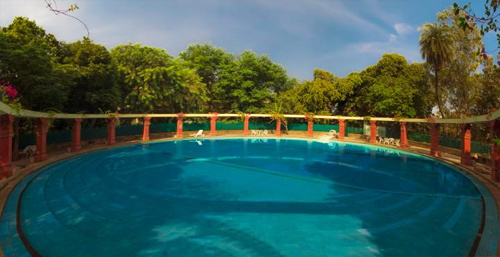 The swimming pool at the hotel is built as A Roman Bath and one of its kinds in the country. During late evening, the guests can enjoy candle lit dinners by the pool. On prior notice, a live musician can be arranged as well. 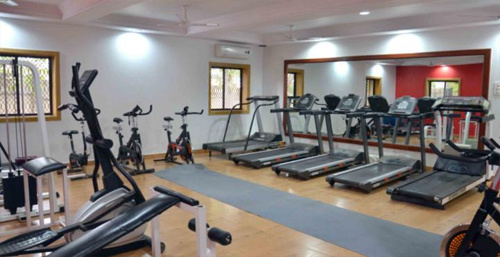 The hotel is being located at 8 km from Bhavnagar Airport, 2 km from Bhavnagar Railway Station and 1 km from Bus Station.